For the original article, and more like it, feel free to visit the Trial by Fire. Crews continued to work on stopping the leaking Deep Sea Horizon this week, with limited success. The new cap over the leak is capturing around 10,000 barrels of oil per day, but scientists are conflicted as to how much more is still escaping. Experts have recently revised their estimate to nearly 40,000 barrels a day. It has been over a month since the leaking oil rig exploded, killing 11 workers and spewing thousands of barrels of oil into the ocean around it. The disaster in the gulf is not only an environmental catastrophe, but an economic disaster as well. Naturally, working people will take the brunt of both on their own shoulders. The Louisianna Oil and Gas Association estimates that Obama’s moratorium on new drilling contracts and an outright halt of drilling on 33 already operating rigs could put as many 75,000 people out of work. For every rig halted, up to 1,400 jobs are at risk. Younger workers on the rigs are especially vulnerable. “”If we see a good deck hand with good initiative who’s got promise,” says oil rig manager Pat Matte in an interview with the Huffpost, “we talk them into going into debt, buying a house, buying a car, so they have to stay.” In this way, generation after generation of oil workers is forced to stay in the trade. On top of managements scam to bring young workers into debt, the job naturally attracts high school graduates and dropouts. Without having to go to college, young workers can enter into the industry and immediately start making good money. On top of laid off oil rig workers, those working in the shrimp and fishing industry in the gulf are finding themselves jobless as well. Shrimper Billy Delacruz signed up to participate in BP's program to employ local fishers to assist in the oil clean-up efforts. According to the National Marine Fisheries Service, the Gulf produces 73% of the nation’s domestically produced shrimp and 59% of its oysters. As the oil spreads further out from the rig, shrimp boats and fisherman are forced to close down their business and begin running clean-up operations at a fraction of the pay they would otherwise be recieving. Workers helping with the cleanup, moreover, are being exposed daily to extremely dangerous chemicals. The Los angelas Times reported that Rep. Charlie Melancon (D-La.) has recently called on the federal government to open up mobile medical clinics to deal with workers’ increasing health problems. Workers like George Jackson, a local fisherman who has been forced to work on cleanup crews in the Gulf since the fishing industry has been closed, have reported severe chemical burns, dizziness and lightheadedness while on the job. “As he was laying containment booms Sunday, he said, a dark substance floating on the water made his eyes burn. BP, however, has not only refused to issue respirators to workers, but has actual forbid respirators from being used on certain job sites. Neither have they distributed gloves, suits, or any other kind of protective gear to many fisherman. While oil has been gushing from the ocean floor for well over a month now, it has only recently hit the coastline of the U.S. These tides of oil, moreover, are just the beginning of our problems. To date, BP has spent a little over $1 billion in its cleanup efforts in the Gulf – or a little less than one fourteenth of its total profits from last year. With such meager funding, and even poorer foresight, its no wonder that analysts like Gulf drilling expert Nansen Saleri have forecast that the leak may continue until christmas. What this means for local wildlife and the health of the ocean, beaches, and marshes is still not fully known. Greenpeace activists, along with researchers from major universities and laboratories from across the country, have traveled to the Gulf Coast to begin researching the effects the oil spill has had. Amongst their findings, perhaps most disturbing so far has been the discovery of ”deep water plumes” – new combinations of gas and oil with methane levels nearly 10,000 times higher than in the surrounding ocean. Bacteria inside these deep water plumes have lowered oxygen levels in the surrounding ocean, leading to fears of possible new “dead zones,” or swaths of ocean no longer inhabitable to sea life. One such plume, discovered by the research vessel F. G. Walton Smith, was more than 15 miles long, 5 miles wide and 98 yards thick. Indeed, researchers are concerned that animals lower on the food chain, having been poisoned in the gulf, may in turn poison other life as they spread out across the ocean. Confirming these fears, activists have also found dead porpoises, crabs, fish, and pelicans - some of which had been recovering in environmental refuges after having been listed as endangered. Workers have no reason left to support the oil industry. It is an archaic, destructive, deadly business. It makes us sick, destroys our planet, and worst of all, it kills our loved ones. The disaster in the Gulf however, as tragic as it is, may provide us with new possibilities. The tens of thousands of laid of oil rig workers have no reason to cuddle up to their former employers. Not only have they been blown up, poisoned, laid off and lied to, but they’re now expected to clean up the mess for a mere fraction of their previous wages. Oil rig workers should demand that BP reinvest its profits into not only the cleanup and restoration of the Gulf, but also into the creation of sustainable energy. Current employees of the rigs, moreover, should be paid by the company to be retrained and placed in the first available jobs in the new industry. 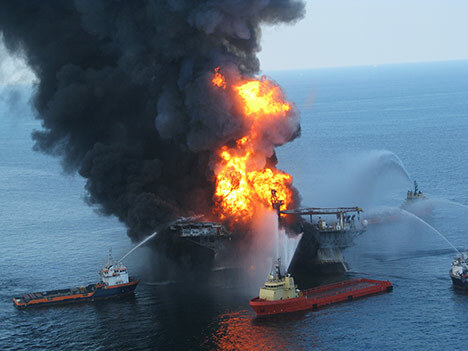 USA today recently reported that BP has hired 13,800 people across the Gulf states to help with cleanup efforts. Workers should demand that these jobs be better protected by issuing all necessary safety equipment and education. Environmentalists, union leaders, workers and, indeed, all people have a vested interest in forcing BP and the oil industry in a new, safe, and sustainable direction.